﻿Published by Sareth Ney on May 22, 2018 at 4:49 p.m.
Fla. – Eric Schwartz and Billy Galewood will embark on an expedition, as part of the “Release The Sounds Tour”. The trek begins on May 22 at The Abbey, in Orlando. It concludes on May 26 at the Corazon Cinema and Café, in St. Augustine. Appearances for Schwartz in multimedia include: Showtime, G4, E!, TBS, BET, “Comics Unleashed with Byron Allen”, “The Tonight Show with Jay Leno”, former host of “On The Spot”, SITV, narrated for “Animal Atlas” and Mun². Schwartz’s comedy special, “Surrender to the Blender”, can be seen on Hulu. As a collaborator, Schwartz has worked with: Jason Mraz, Craig Robinson, Anjelah Johnson, Tiffany Haddish, Disney, Yahoo, Headline News (HLN), Machinima, Maker Studios, MiTu Networks and more. Website, Twitter, Facebook, Instagram, Pinterest, Google+ and YouTube. “My show is like a kid’s birthday party…for adults,” Galewood stated. Galewood is also a musician who formerly went by Bushwalla. He is a “song-juggler and self-proclaimed Original Gangster of Cleveland”. His discography includes: “Ordinary Tales of Madness”, “Uncovered”, “Demolisten Man”, “The Man Who Invented The Sky”, “Don’t Believe The Hype”, “Autodidactical, Freestyle, and Radical” and “Ghetto Blaster”. 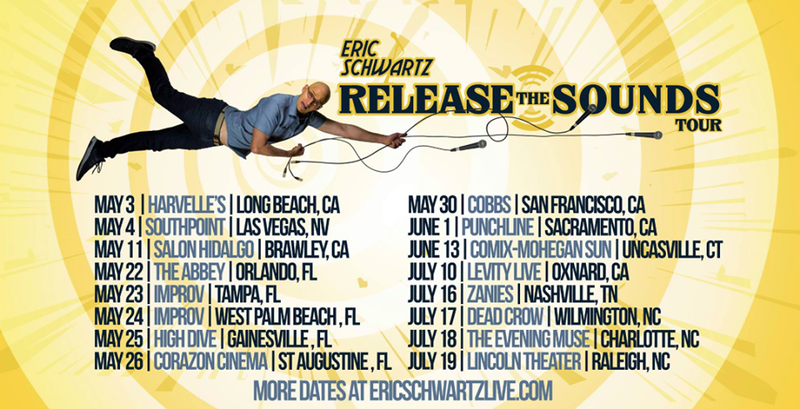 Tickets to attend Schwartz and Galewood’s “Release The Sound” tour can be purchased at Schwartz website at http://www.ericschwartzlive.com/tourdates. May 22 - The Abbey, Orlando, Fla.
May 24 – Improv, West Palm Beach, Fla.
May 25 – High Dive, Gainesville, Fla.
May 26 – Corazon Cinema and Café, St. Augustine, Fla.
June 1 – Punchline, Sacramento, Calif.
June 13 – Comix at Mohegan Sun, Uncasville, Conn.
June 20 – The Siren, Morro Bay, Calif.
July 10 – Levity Live, Oxnard, Calif.
July 16 – Zanies, Nashville, Tenn.
July 17 – Dead Crow Comedy, Wilmington, N.C.
July 18 – The Evening Muse, Charlotte, N.C.
July 19 – Lincoln Theatre, Raleigh, N.C.
Oct. 4 – Slowdown, Omaha, Neb. Oct. 7 – 10 Mile Music Hall, Frisco, Colo.
Dec. 16 – New Hope Winery, New Hope, Pa.
June 2 - Hop Sauce Festival, Frank Panzone Memorial Park, Beach Haven, N.J.